The NRA’s NRA Women On Target Hunting Progam organizes a popular series of women-only outdoor adventures every season. Currently, there are 11 Women on Target hunts planned for 2010. For a woman looking for a “no-stress” hunting holiday guided by skilled outfitters, this is an excellent choice. Starting as $276 for a two-day duck hunt, many of these events are quite affordable, so they would make a unique Christmas present for a female family member or your favorite lady shooter. CLICK HERE for Women on Target hunt details and pricing. NOTE: One spot is still available for the combo hunt at Addisson Ranch in Oklahoma. Ladies will have a chance to stalk and shoot Whitetail Doe, Wild Hog, Coyote, and Bobcat. 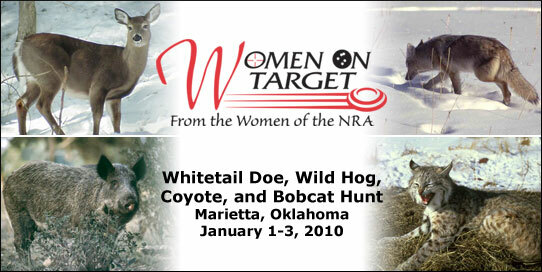 Share the post "2010 Women on Target Hunting Schedule"